Moisturiser enriched. Suitable for everyday use. Finally the care and protection that your family deserves to help keep your hands healthy. Our antibacterial formula effectively cleanses your hands and is also soft on skin. Dermatologically tested* *Base formulation has been tested. 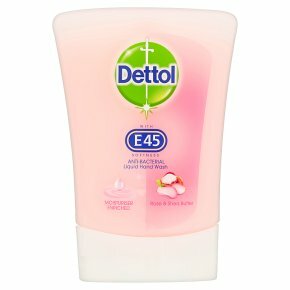 Usage Directions: For use only with Dettol No-Touch System. Using On/Off button, switch dispenser Off. Remove empty refill. Insert refill into dispenser until it clicks. Using On/Off button, switch dispenser On. Wet hands and place under the nozzle - soap will automatically be dispensed. Lather hands, not forgetting nails and thumbs, then rinse off & dry. SAFETY INFORMATION:<br>For external use only. Keep out of reach of children unless under adult supervision. Avoid contact with eyes. In case of contact with eyes, rinse immediately with plenty of water. If persistent irritation occurs, get medical attention.